Picture a full facial (cleansing, exfoliation, mask, the works), but accompanied by a soothing hand scrub and massage of the hands, arms, shoulders, neck, and scalp. The treatment uses Skoah's limited edition brown sugar and vanilla holiday hand scrub, wash, and lotion, which are also available for purchase as a trio. 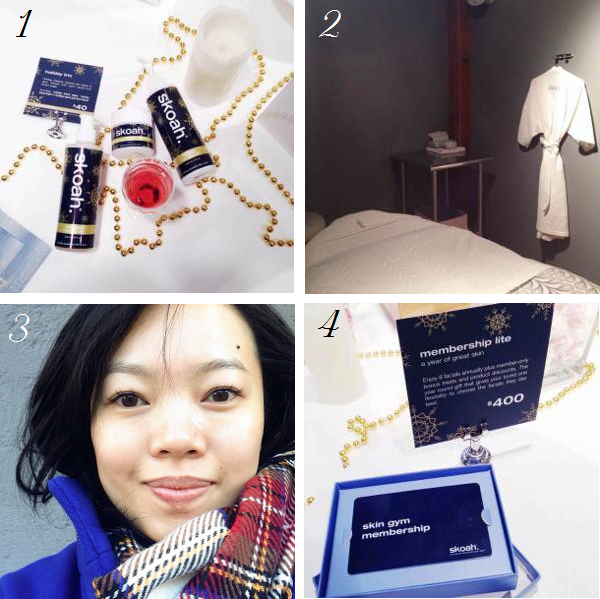 The Holiday Facial makes complete and brilliant sense when you stop to think about it. After all, your upper body goes through a lot of repetitive stress and strain around this time of year. Spending 8+ hours in front of a computer every day breeds patterns of holding and tension in your wrists, forearms, and tendons. Then there's shopping (and carrying big packages), baking, cooking, spending hours writing Christmas cards...it's no wonder we can feel fatigued and achy in odd places. With all the time I've spent working and blogging lately, I was definitely looking forward to my treatment at Skoah's Yaletown location. My aesthetician Natasha tailored the facial to my main skin concern, dehydration. First, she cleansed and toned with the kleansing lotion and tonik. She then applied the peppermint-infused aha mask, which was warm and tingly and yummy-smelling and altogether invigorating to the senses. While the mask's alpha hydroxy acid worked its magic in sloughing off dead layers of skin, Natasha used the holiday hand scrub to exfoliate my hands, massaging my arms and fingers as she went along. Next, it was time to treat my freshy exfoliated skin: a little eye kandy eye cream, then the intensely hydrating yet oil-free hydradew mask followed by the rich gold serum. As the product absorbed, Natasha massaged my upper arms, neck, and shoulders (I asked for a bit more pressure since I tend to carry tension there). Lastly, she applied face skotion 30 to lock in the hydration from the treatment and provide SPF 30 sun protection, and finished with a light neck and scalp massage. I'm no stranger to Skoah's minimalist facilities, "personal training for your skin" motto, and in-house products as I was a semi-regular client of theirs many moons ago, but the Holiday Facial is a novel and delightful spin on the familiar. By the end, I had glowing skin sans makeup and felt more relaxed than I had in weeks, my mind rendered a pile of tranquil mush. Whether you're looking for a way to #treatyoself this holiday season or for an early gift idea, I can guarantee you that the Holiday Facial will be greeted with open arms and wide smiles. Desks job really do us in, don't they? I definitely need a massage - all the time, not just this time of year, but all the wrapping and card writing after work only makes it worse! I never thought of having one as part of a facial but it's actually a pretty brilliant concept. Yes! I actually gave myself a crick in the neck one year, hunching over for hours on end writing Christmas cards. The next day I couldn't turn my head.